Almost exactly one year ago I took a series of walks that took me to each hotel and motel within Redwood City’s borders. I of course wrote a post about that, titled Checking In. In that post I also mentioned four more that, back then, were either under construction or in the planning stage. Since then we have seen a lot of action on the hotel front, so it seems time to provide an update on those four hotels. Although none of the four are within Redwood City’s downtown, I will nevertheless begin with an overview of our downtown hotel situation. As anyone who has spent any time in Redwood City knows, we’ve made great strides on the first two categories, to the point where we have essentially hit the respective limits. Retail hasn’t fared nearly as well: I believe that, as of today, we actually have less retail space within the DTPP area than when the plan was first approved. Although a handful of the new buildings include some retail space, an even larger amount of retail was destroyed in order to make way for those (and other) new buildings—resulting in a net loss. And then there is lodging. 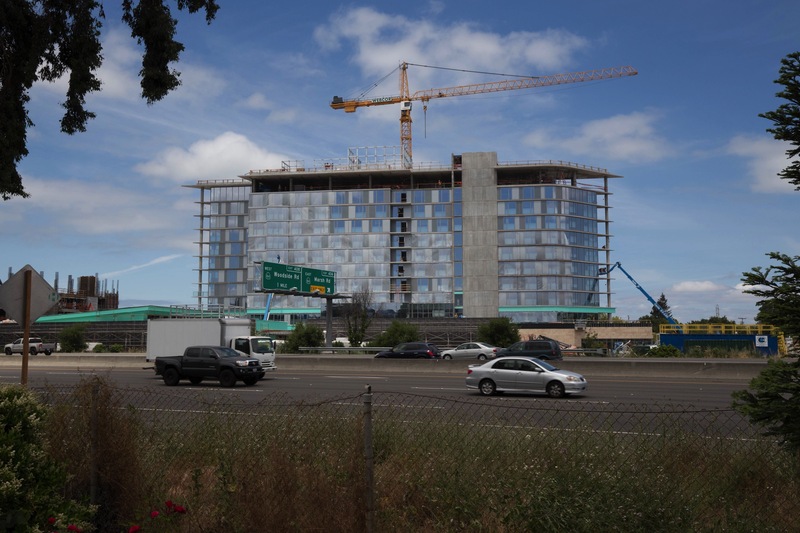 Since the plan was approved back in 2011, not a single new hotel room has been built in Redwood City’s downtown—and nor are there publicized plans for any. Currently there are only two hotels within the DTPP area: the historic Sequoia Hotel, at the corner of Broadway and Main, and the Euro Hotel, also on Main. The 54-room Sequoia Hotel, although historic—it was built in 1916—appears to be more of a transient lodging house, and thus isn’t the kind of hotel at which most of us would consider staying. As for the Euro Hotel (previously called the Pacific Euro Hotel), it is a European-style hotel located at 868 Main Street. Many of the Pacific Euro’s 53 rooms rely on shared bathroom facilities, much as you’d find in a hostel. This hotel does seem to get fairly good reviews for its small rooms (the basic rooms are 95 square feet in size, and sport a double bed, a “micro fridge,” and a TV), and the price is right: I checked the rate for a weekday night in September, and it was only $99 for a “European Economy” room (if you aren’t into sharing, the slightly larger “European Style Room with Bath” runs $149 per night). Of course, Redwood City has a number of other hotels and motels outside the DTPP area (mainly along El Camino Real, as you might expect). Until recently we have had little activity anywhere in the city on the hotel/motel front, with the exception of a remodel or two. 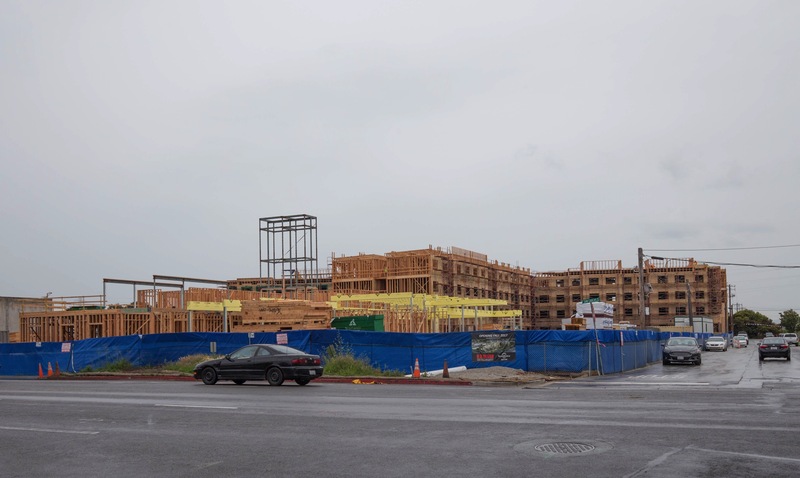 But recently Redwood City, San Carlos, and Menlo Park have all experienced a surge in hotel projects: a couple are underway, and a couple more are working their way through the approval process. As you might expect, the hotel is somewhat pricey: weekday rooms start at about $325 per night. For some time now I’ve been watching and reporting on San Carlos’s hotel project. That hotel, which on the surface appears to be a reaction to ours (but is not, of course), is also along Highway 101, just south of Holly Street on Industrial Road. It was originally intended to be an extended-stay Landmark Hotel, but as the project has proceeded it has become a Residence Inn by Marriott. 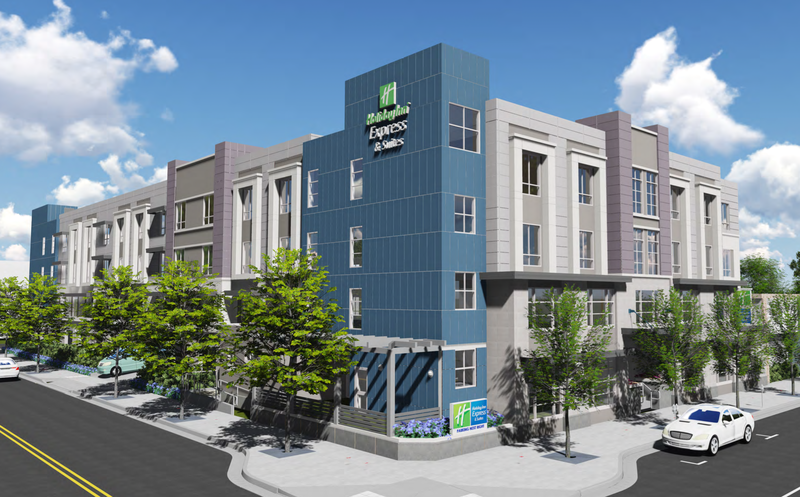 The name may have changed, but the hotel itself has not: when complete it will be a four-story, upscale, extended-stay hotel. Unlike at Redwood City’s new hotel, each of its 204 guest rooms will have its own kitchen. As well, guest vehicles will park in a surface lot; this project does not include a parking garage. See the metal structure sticking up near the middle of the building? I presume that this will contain the elevator shafts, and thus defines the building’s ultimate height. Although a bit hard to see here, the building is roughly T-shaped, with the stem of the T extending towards the front of this picture, and the top of the T, which parallels Highway 101, along the back. Curving alongside the Marsh Road off-ramp will be one of the three office buildings, and one of the three parking garages will sit between the two (the beginnings of that parking garage are just visible at the left in the above picture). Menlo Park’s hotel will be an eleven-story, “full-service, 4-star, high-rise hotel” with some 250 guest rooms, 43 of which will be suites. Part of the “Autograph Collection,” this hotel will be run by—any guesses?—Marriott. Room prices are not yet available, but because it is a “4-star,” “boutique” hotel, I’m guessing that they won’t be cheap. The 200,000 square foot hotel will also include meeting spaces and a ballroom, along with an outdoor pool and spa. 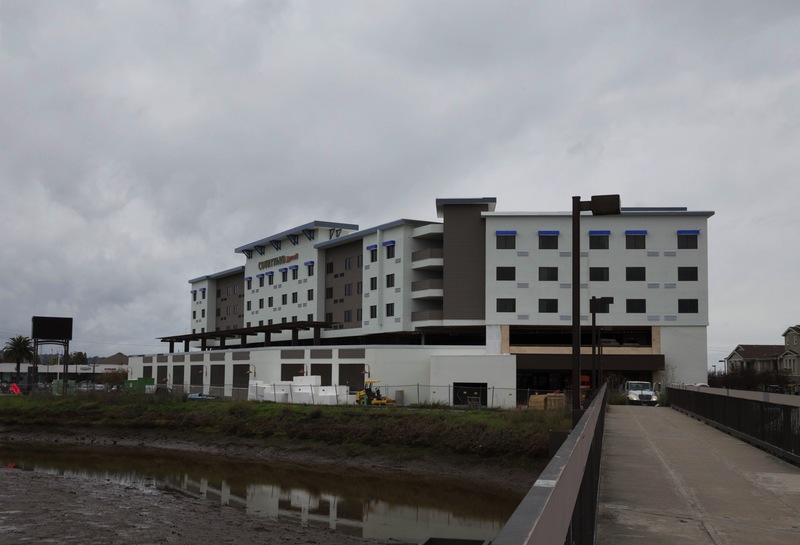 With three good-sized hotels either open or well underway you would think that might put a damper on any other hotel projects, but Redwood City and San Carlos each have an additional hotel working its way through their respective approval processes. This old motel, which was built in 1939, has seen better days. Whether or not the proposed project is the right design, I for one would love to see this motel get replaced by something more modern and attractive. A new hotel would, I believe, provide a boost to this section of Broadway. And because it would be located within an easy walk from downtown Redwood City, hotel guests would be able to enjoy our downtown restaurants and entertainments in addition to the restaurants that have popped up on Broadway between Spring Street and Woodside Road. 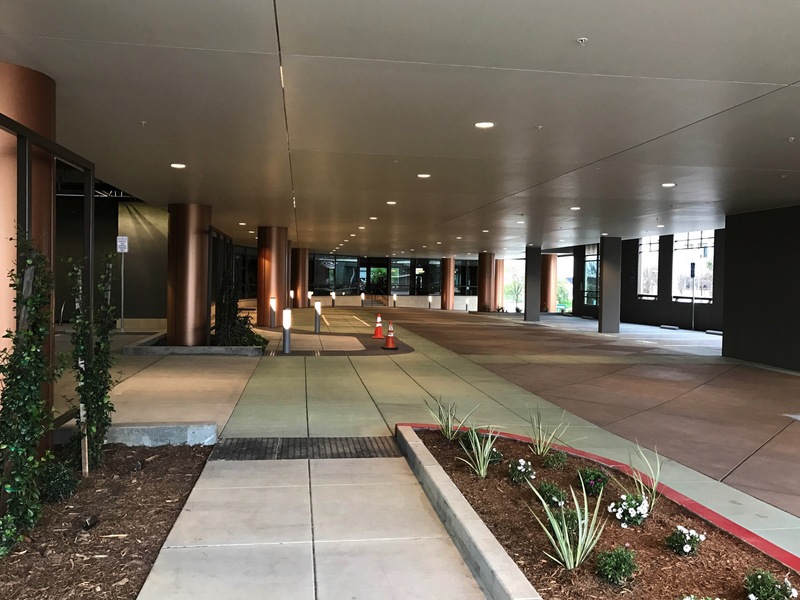 As designed the hotel—branded a Hilton Garden Inn—would sport 162 rooms and an attached four-level parking structure that, together with a handful of surface parking spaces near the hotel entrance, could accommodate some 160 vehicles. One big change from the current building is the hotel’s height. Plans call for a seven-story, 84-foot high building. In this particular part of San Carlos currently the maximum allowable height is only 50 feet, so this would be considerably taller than any of the buildings in the immediate vicinity. 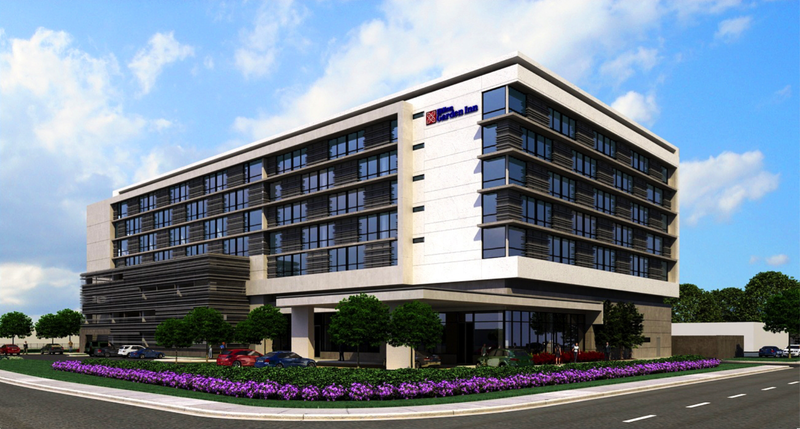 The project applicant points out that this hotel is of a comparable scale to the existing Palo Alto Medical Facility building (which is 84 feet tall) and to the recently approved Windy Hill office development, which is designed to be just over 87 feet in height. Although neither of those are adjacent to the proposed hotel, all three lie in the same zone between Industrial Road and Highway 101, so there is some logic in allowing this building to exceed the current limit. The Hilton’s first floor would include the lobby, dining facility, and offices, while the second floor would be made up almost entirely of five small meeting rooms. Guest rooms would occupy floors three through seven. Based on recent activity, it almost seems as if our local real estate developers have tired of building office and apartment buildings and have turned their focus to hotels. That isn’t actually true, of course, but we do seem to be experiencing a wave of hotel construction. Regardless, I for one am glad to see new hotels springing up in Redwood City: not including the recently opened Courtyard by Marriott, Redwood City has a total of just over 1,300 hotel/motel rooms, which, given the size of our city, doesn’t seem like a lot. Together the Courtyard hotel and the proposed Holiday Inn would add 267 more, giving visitors to Redwood City that many more reasons not to stay in one of our neighboring cities. New reader to this blog. Reading some old posts. I have a question and comment. I keep hearing of more closings for Kmart and Sears around the country, but the one on Veterans Blvd keeps surviving the chopping block. If this store ever closed, and the land sold, then I think this location would be ideal for a new hotel, if the city needed more hotel rooms. 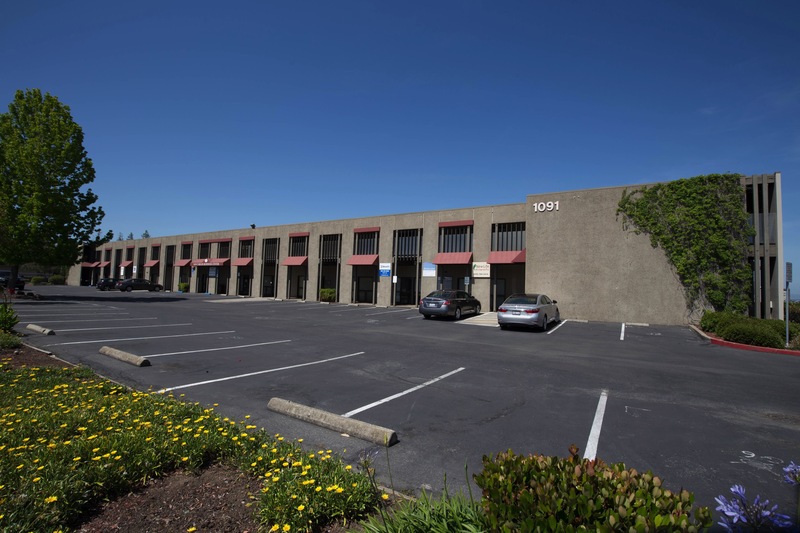 It’s walking distance to downtown and nearby shopping, close to Facebook and all the new tech companies coming in, and also across from Kaiser hospital. This hospital is a regional neurosurgery and stroke center, so some patients need hotel rooms for visiting family members. Lastly, there’s land for ample parking. Another high rise office or apartment building wouldn’t benefit the city as much as a large hotel would. Have you heard anything about this Kmart lot? I’m sure there’s a rich history to this store. Welcome, and thanks for reading! I have not heard anything concrete about our Kmart, but I know that there is great interest in that property on a number of fronts. For instance, one of our former Parks and Rec commissioners was passionate about turning it into a giant urban park. And you can bet that any number of developers would love to get their hands on that property, either for housing, office, or both. And you are right–a hotel would be great on that site. Kmart has a prime spot, being close to the bay, to our downtown, and being surrounded by other retail. Seemingly almost anything would work there. But as yet I have not heard of any concrete proposals–indeed, I watch closely but have yet to hear any credible rumors of that store’s closing. I rarely go inside, but when I do (or when I walk past, which is often) they seem to be doing a fairly good business, so perhaps ours is one that will last. We’ll see. Regarding the run-down Garden Hotel on Broadway, It seems like quite a few folks who cannot afford cars stay there. There are bicycles outside almost every room. What will happen to those folks when they get pushed out? It’s hard to believe that the price at the Euro-Pacific Hotel in Redwood City, has only gone up $25. since 2003. It was $73.44 for one night with shared bathroom in March of 2003. Each room has a fireplace, the back ones have balconies overlooking a beautiful gardens and they have a chef that comes in every day to cook whatever the guests want! Even complementary Chardonnay. What a deal for less than $250 a day. You should go and see it for yourself. I’ll second the Atherton Inn as being fantastic. I live nearby and my parents always stay there when visiting from NH. They love it. 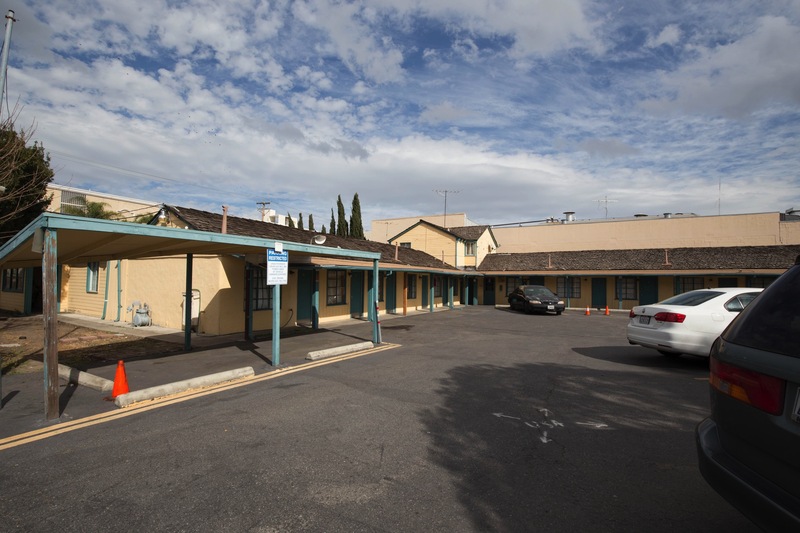 I didn’t mention it in this post because this one was focused on the new hotels; in my previous post on hotels, which I linked to in the second sentence of this post, I mentioned the Atherton Inn (along with every other hotel or motel in Redwood City). I’ve walked by it but have yet to go in; based on your recommendation (and Tom’s), I guess I need to check it out! From their website it seems nice, and your description makes it sound great. Thanks for the recommendation. I believe Facebook is planning a 200 room hotel on its property in MP. I do believe I’ve heard that. Thanks for the reminder; I’ll add that project to my list of things to check out. I saw that (about Menlo Gateway). Interesting, but not all that surprising given the proximity of Facebook’s headquarters to that huge office project. Thanks for all the links!